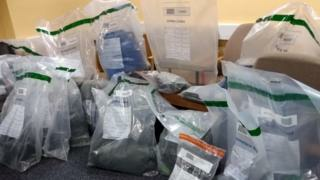 Two men have appeared separately in court after police seized suspected class A drugs worth £1m in Mid-Ulster. Aaron Kelly, 24, and Carl Ritchie, 27, both from Coalisland in County Tyrone, were arrested on Friday after an operation by the Police Service of Northern Ireland (PSNI). Police found drugs paraphernalia, a suspected stolen car and criminal property in their searches. Mr Kelly is facing six charges while Mr Ritchie is facing three. Mr Kelly, of Ardnasken Park, appeared on charges including possession of cocaine with intent to supply; possession of cocaine and possessing and concealing criminal property. In court in Omagh, police linked him to a sophisticated drugs factory found in Stewartstown in County Tyrone. Mr Ritchie, of Mourne Crescent, is charged with possession of cocaine with intent to supply; possession of cannabis and possession of criminal property. Police told the court that he was arrested as part of the investigation which had led to Kelly's arrest. Both men were remanded in custody to appear at Dungannon Magistrates' Court on separate dates next month. On Friday detectives said the operation by the PSNI's organised crime unit was linked to other searches in the area in recent months in which £565,000 worth of class A drugs were seized. The most recent discoveries were made during searches of five properties, including at least one in Coalisland.